7:00-8:00 mile pace is my comfort zone for east runs. Jack Daniels Running Formula 3rd Ed. At the end of the day, I ask myself if I did everything I could have TODAY to be better than I was YESTERDAY. For running, that answer is almost always no. And that’s why I run; because it’s one of the only sports where it’s you against yourself. I run because it’s one of the purest forms of honesty and the benefits you get out of it will be no greater than the effort you put into it. It was my first and only marathon. All I wanted to do was break the 3 hour barrier, and I wasn’t sure I had put in the training to do so. (Not a good feeling to have on race day!) I crossed the half way point feeling not the slightest bit tired having averaged 6:40 miles. Over the course of the next 13.1, I averaged 6:20 mile pace, with my last 6.2 miles being the fastest at a 6:10 mile pace. 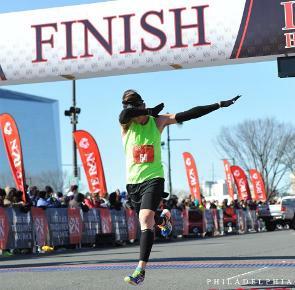 I never hit “the wall”, and I crossed the line in 2:51:17. One of the best experiences of my life. I pace because I want other runners to experience the same level of success that I’ve had in my running career. Helping other people achieve their goals is just as satisfying, if not more, than me achieving my own. Probably my senior year of high school when I paced 7 guys under the 5 minute mile. I like coffee and food. Serving my country is pretty rewarding if that counts as philanthropic. Other than that I regularly donate to the Wounded Warrior Foundation and participate in New Jersey’s Run for the Fallen.